Cowboy Poet Mike Puhallo was the real thing! 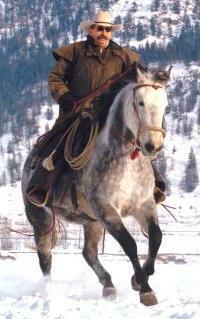 He was a working cowboy and a horse trainer, and spent many years ranching. In his younger years he rode saddle bronc and did some packing. Many of these cowboy experiences are the back ground to his Cowboy Poetry, but a lot come from stories that he picked up from old time cowboys and ranchers. Many of his stories are also based on history. These derive from being an avid student of the culture and history of the "real west"! Mike was instrumental in establishing The BC Cowboy Hall of Fame and The Kamloops Cowboy Festival, and the BCCHS Student Scholarships and he served many years as President of the BC Cowboy Heritage Society. Mike was a widely published cowboy poet and was one of the very few Cowboy Poets in the world to actually make a big part of his living from his Cowboy Poetry. He is the only cowboy poet to have his work read into the official record at a NASA launch, and in the Canadian House of Commons. Mike not only performed at cowboy gatherings and festivals, but also took his poetry into schools, libraries, and community halls throughout the West. His poetry appeals to a broad audience, not just ranchers and working cowboys, and he wrote all of his own poems. Mike performed at brandings, coffee houses, stock shows, kindergarten class rooms, writer's workshops, and even put on shows at Biker's Bar-B-Qs. This just touchs on the many venues where he entertained - showing how versatile his was. Mike passed away on Friday, June 24th, 2011 ... but his poetry lives on. To read more about Mike have a look at: About Mike Puhallo.